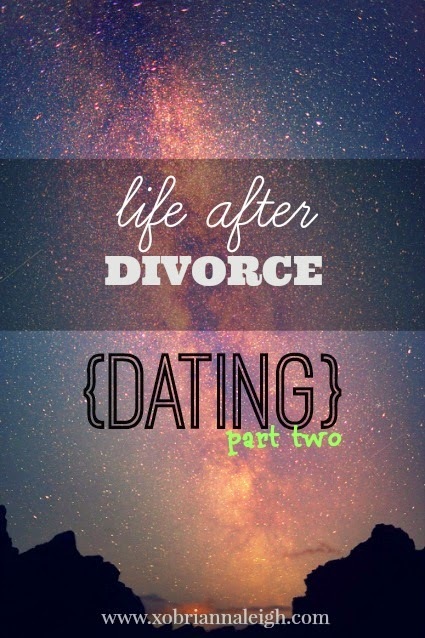 Life after divorce means eventually dating. It means eventually loving. Catch up before reading further with part ONE and TWO. So there I was, exclusively dating M and loving him along the way. We talked about our futures, we started using “we” instead of “I”. The signs were all there. After all, we loved each other! It made me fully aware that I could love again, which is something that honestly scared me for a long time. After being hurt so badly by my ex, could I ever trust or love someone again? Well, I learned the answer to that was a resounding yes! Not only could I, but I did. I found myself really caring about M and going out of my way to do things for him and be there for him in any way that I could. I’d sacrifice sleep or blogging or a night on the couch watching Grey’s Anatomy reruns to spend time with him. And things were great! There were the typical feelings of coming up short for someone. I worried I wasn’t good enough for him or that I didn’t live up to what he really wanted in a serious relationship. But as time passed, I started feeling that I wasn’t satisfied anymore. I started stressing out over things I couldn’t control and prayed fervently. M had some things going on that he needed to work on and focus on, but I truly believed he’d get it all taken care of, somehow, someway. Little did I know that those feelings would eat away at me little by little. I called my sister constantly to ask her what I should do and to justify my feelings, that this is what a new relationship feels like. I had a few talks with M and he reassured me about a lot of things, but nothing improved. In four months, he only took me on ONE date. He didn’t have time for me anymore unless I was able to show up while he was at a scheduled function each week or just made myself available in the middle of the night when he was awake. For a while, that’s what I did, but it got old quick. I wanted more. I needed more. I needed more than he could give me. I learned that not only did he not have time for me, but he didn’t have money, time, or energy for me. He was dissatisfied with his job and constantly complained about it. He had some habits he needed to really focus on and improve. He also had some medical things to take care of. But nothing changed. Excuse after excuse, I’d let it slide, thinking it would pass. I mean, I loved this man! And then all of the feelings I felt with my ex-husband came flooding back: having to fix his problems, stressing over his situations, bending over backwards to be there when it was convenient for him. But when I needed him, he was nowhere to be found. He didn’t reciprocate the actions, and we all know that actions speak louder than words! I felt I deserved more, that I deserved better. I certainly deserved to be treated better. I refused to settle for someone that reminded me of my ex, that had the same behavioral patterns. And then, one day, I finally made the decision that I needed to end things with M. It was over. I might have cared about him, really cared about him, but I no longer loved him. How do you continue loving someone that fails to meet your expectations, when your expectations aren’t very high to begin with? You don’t. At least, I didn’t. And then, for the first time in my entire life, I took matters into my own hands and broke up with him. Before that day, I always stayed in toxic relationships until the guy left me. I just really, really don’t like hurting people. But having been hurt enough recently, I wasn’t going to allow myself to suffer any longer. I broke up with him, and it hurt him. He was taken aback by the words I said and that I was actually ending what we’d built. I wondered if I’d regret it or constantly think to myself if it was the right thing to do over several days or weeks or even months. But the reason I knew and know it was the right decision was because a weight was lifted almost immediately. I no longer felt the stress that his life brought to mine. I no longer felt burdened by having to fix his employment or financial situation. I was no longer disappointed by him, and I felt free. My relationship with M taught me a few things: that I could love again, that it’s okay to put myself and my needs first above hurting someone else, and more of what I needed in a significant other. It also taught me a lesson in love. Did I really love him? Was that really what love looked like? It felt natural, because it felt like I had with my ex-husband. But is that real, true love? Giving and giving and giving, being disappointed and let down, and feeling the constant stress of someone else’s problems…is that what love is all about? I learned the answer to those: no. Life after divorce is still life: breathing, sighing, laughing, living. It’s not the end of the world, even though that’s exactly what it feels like. It’s hard, but not a normal ‘hard’ phase of life that one would typically think of. It’s more than that, so much more than that. And along the way, I’m learning. I’m learning that I’ve got to keep putting one foot in front of the other and live off of faith. I’m learning that there’s nothing easy about starting over. I’ve learned that moving forward was harder than I could have ever imagined. Why? Falling out of love with your ex-spouse is one thing, and it’s a good thing. It’s the first step in a process that has an unlimited number of steps. (Oh how I sometimes wish divorce could be solved and figured out in a 12-step program…) Once that’s done, though, I found myself in a whole other world: dating. So, I began dating. And not only that, I began online dating. Oh yes, you can guarantee that people had their own reservations and opinions on THAT kind of dating on top of just dating in general. Oh Em Gee. It never ended, but I took it all in stride. I was doing it for me and for no one else. Who really knew what was best for me other than myself? Sure, I turned to my loved ones and friends for advice and support, who do you think has laughed with me along the way?! It’s definitely been a rollercoaster of a ride, but it’s been fun, and necessary. In all seriousness, I was nervous about dating again. It had been more than 5 years that I dated and I didn’t even know what that looked like anymore. Not in today’s society. I was also scared about opening my heart again. What was I looking for out of dating? Something fun? Flirtatious? Something serious? To settle down? To go out during the week with? To share my life with? Those were just a few questions I’ve had to answer for myself along the way. And the answer was yes to all of them, at different times, but yes nonetheless. In the beginning, I went on dates, dates with guys I couldn’t necessarily see a forever with, but they were fun and totally in the moment. I went out with guys that complimented me and made me feel good about myself (hey, I was dumped by my ex-husband and my ego was bruised, what else is a girl to do?!). I went out with guys that weren’t super successful or didn’t have a lot going for themselves other than their looks. I went to movies and dinners, got free drinks at bars, you know, I DATED. There were some duds, some fun ones, some amazing ones, and some that kept coming back for more. And it felt amazing. There was no commitment. There were no expectations. There was only fun, in the moment, laughing, smiling, being woo’ed (?!) kind of fun. And I was all about that! I enjoyed it and felt that it truly was a necessary step in my healing and moving on process. For me, dating was essential. None of my memories consisted of only my ex. He didn’t consume all of my “lasts”, and that was huge to me. I was creating new memories and had a blast doing it. Life post divorce is difficult in more ways than I could’ve ever imagined. Not that I imagined being divorced, because it was never even on my radar. I for sure thought I’d never be a statistic in that way. But, here I am, divorced. And I’ve learned a lot along the way. There really isn’t anything easy about having to start over. 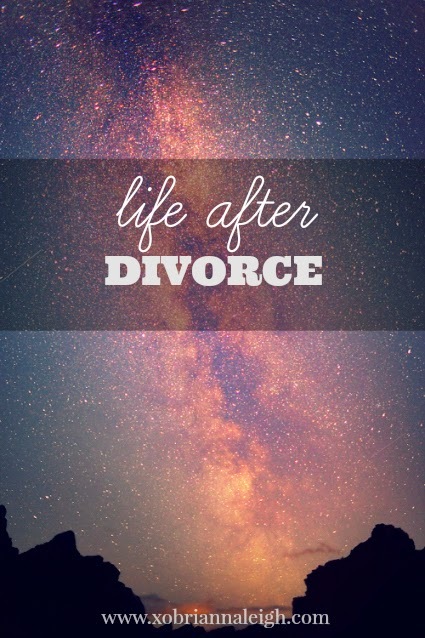 Getting divorced completely changed my life. First of all, I had to fall out of love with someone that meant a lot to me, someone that I saw my forever with and dreamed of a future with, someone that I tried my hardest to put first and love unconditionally. Talk about hard! It did help that he hurt me so much, but it still was no easy task. It’s not something anyone can prepare you for. Besides that, I had to get used to living alone again. No husband, no dog. Just me and my thoughts, my feelings, my emotions, my craziness. And let me just say, the silence was deafening for a long, long time. I tried filling it with different things, but the emptiness was still there. I struggled to find a new normal, to make my home cozy and warm and somewhere I really, truly wanted to be and be okay being there all alone. And eventually, I did, but boy did I struggle. Part of getting used to being alone was cooking and eating. I wasn’t used to only feeding myself, so I wasted a ton of food that I bought and couldn’t get around to eating or drinking before it expired. I didn’t have a routine of when I’d eat or what I’d eat. And most of all, I really hated cooking for only myself. I felt it was wasted effort and time. It was much easier to just grab a frozen dinner and pop it in the microwave for a few minutes, eat, and throw it away. No dishes, no hassle, no fuss. I felt like it made it easier, but what I really learned was that it made it harder on myself. I’ve slowly learned to enjoy cooking again and how to balance buying groceries and planning meals so that I don’t waste food. Those quick, no fuss dinners also weren’t very healthy. I’m not one of those people that just stops eating when I’m depressed or upset. I eat my feelings. All of my feelings. So, in the darkest moments of my life, I turned to food for solace. It’s strange that so much food got wasted when I felt as if I was doing nothing but eating. But, that’s how it all went down, and I’m so thankful to be past that point. Now, I plan meals and shop for groceries weekly. It’s what works for me and I’m running with it. Although I’ll still sometimes struggle with sticking to the plan I make for myself. It’s definitely a work in progress! Another work in progress is my finances. Oh my, is that a work in progress! Before any of the divorce or separation came about and I thought all was well with my marriage, we were finally in a really good place with our finances, and I was finally able to not stress about money so much. It was nice! But then my world came crashing down around me and that contentedness I felt was long, long gone. I had to completely start over from the beginning and pinch every single penny once again. I had to really stick to my budget and stress over every dollar. I felt like all I was doing was crying and fussing over money. It was my life for many months until I felt I had a handle on it. It’s definitely gotten better since then, but I’m nowhere near where I want to be and $20 is still a big deal to me! I pray for financial stability every single day, and I know that one day I’ll be there again. I had gotten a taste of it and now I want it more than ever. It’s going to take a lot of hard work and dedication, but I’ll feel it again. I have to. And then there’s everyone else in the world that kept living their lives and enjoying milestones while I wallowed in sadness, hatred, and self-pity. Engagements, birth announcements, weddings, home buying. It all just sent me spiraling back to my dark place as all of my dreams of beginning a family and buying a home were obliterated. Of course I was happy for those who were experiencing it all. They surely deserved it! But it made it that much more obvious of where my life was and how things were turning out for me. Let me just say, they weren’t. I cringed at every Facebook status, blog post, and tweet about a new baby or a new ring. I just couldn’t handle it. It’s what I wanted so badly for so long! But it wasn’t meant to be for me. Not just yet. And that was definitely a hard pill to swallow. It’s still working its way down to this day. I had to turn down attending friends’ weddings and graduations and all kinds of events because I wasn’t in a place to be happy for someone else. What was the point in going? Sure, the people who I turned down understood and didn’t make me feel worse for skipping out, but I hated not being able to be there for them in their joyous moments. I hated not being a part of the celebration. But then, I was finally able to buck up, put my strong face on, and just do it. I attended the first wedding since my divorce on November 1, 2014. And it was a biggie. Two people from my hometown were getting married, which meant anyone and everyone would be there. I dreaded the awkward hello’s and the “so when are y’all going to have a baby” questions. I was really praying that most people would’ve heard or found out in some way, but I also didn’t want to just be ignored because of what I was going through. But instead of worrying about it and freaking out, I just went. With my mom and my brother, I went and was able to be genuinely happy for the bride and groom and in their love for each other. And in my heart, in that moment, I knew that I’d be there again one day. I had hope that I’d find love again, and with my family by my side, I got through it. It wasn’t easy by any means, but I did it. And I’m proud to have gotten past that hurdle. I learned that through my grief and disheveled life, I could be happy for other people in their joy and in their love. What I’ve learned most of all, is that there’s really nothing easy about starting over.